Singapore - Should the MAS tighten or not? The Asian markets will remain under pressure from the global trade war. Media reports as of writing this article suggest an intensified trade war with the US set to slap $50bn worth of tariffs targeting hundreds of Chinese export goods. Beijing has so far responded with a conciliatory approach by further opening up the economy for foreign competition, but retaliatory measures can't be ruled out. 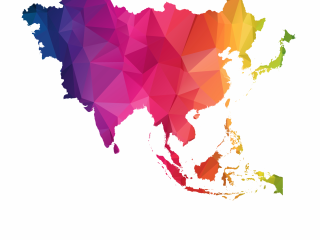 An intensified trade war will be a threat to Asia’s export-driven growth, but for now, the manufacturing data from the region is likely to show that growth has so far remained strong this year. 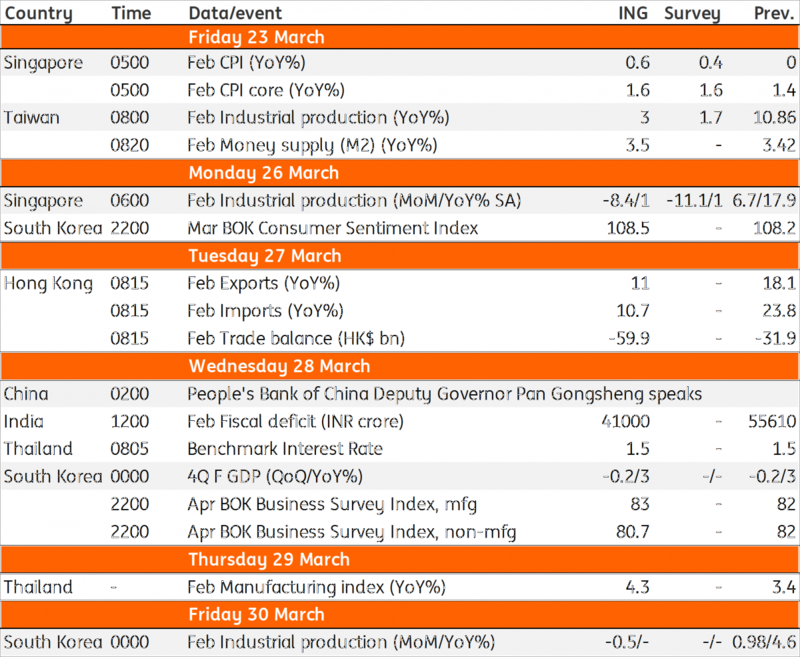 China’s manufacturing Purchasing Managers’ Index (PMI) data for March will be watched closely. Recovery from the Lunar New Year-related slack in activity underlies ING’s forecast of a rise in PMI to 51.5 in March from 50.3 in February. This is no big deal because the PMI has been bouncing around the 51 level since mid-2011, but markets are still sensitive to the soft data. The hard data showed an acceleration in manufacturing growth; industrial production growth of 7.2% year-on-year in the first two months of 2018 was up from 6.6% average in the fourth quarter of 2017. This leads us to forecast steady GDP growth in 1Q18 around the 6.8% YoY pace of 4Q17, contrary to the consensus of a slowdown to 6.6%. February industrial production data is due from Korea, Singapore and Thailand. Singapore should be the most significant as weak non-oil domestic exports in the first two months of the year undermine the view of the Monetary Authority of Singapore (MAS) moving to tightening in April. As of now, the consensus is tilted toward tightening despite the dismal NODX in February. However, manufacturing data could nudge the bias towards an on-hold MAS policy. The growth of exports from Korea and Thailand along with manufacturing growth accelerated as we began 2018. We think the markets will rather focus on the forward-looking Korean activity data on consumer and business confidence indicators. In Thailand, better activity data could provide a further lift to the Bank of Thailand's growth optimism on March 28. But we are still unable to find strong reasons to change our view of no change to the BoT policy throughout 2018. Headline economic growth has improved, but underlying fundamentals continue to be dogged by weak domestic spending that’s also evident in perennial low inflation. In India, budget figures for February will be under scrutiny to see the extent of the deficit overshoot in FY17-18 (April-March). In the first ten months of the current fiscal year, the deficit at INR 6.8tr, was 20% wider on the year, imparting upside risk to the government’s revised forecast of INR 5.9tr or 3.6% of GDP fiscal deficit for the full-year. We expect fiscal slippages to remain among main headwinds for the INR appreciation this year. Other headwinds will be high inflation and widening external trade deficit.